SAORI looms are some of the most beautifully designed weaving looms available. They are lightweight and easy to use. Their minimalist design allows users to experience SAORI weaving with ease and comfort. This guide outlines some of the major difference between the SAORI loom models. I have included my thoughts and observations in the summary. If you need assistance deciding which model to purchase, please contact the studio to discuss your options. SAORI looms are manufactured in Osaka, Japan. Each loom is made by hand, one at a time, in a small factory setting at SAORI no Mori. The primary SAORI loom models are the SX-60, SX-60H, WX-60, and CH-60. The maximum weaving width for these looms is 60cm. They are all compatible with SAORI 60-series accessories, including 60-series reeds, insides sets, and 4-harness conversion kits. The SX-60 is SAORI’s wood and metal frame folding loom. It can be collapsed for storage and transport. The SX-60 is a true workhorse. The metal tubing offers tremendous durability, which is an important attribute if you plan on traveling with your loom. The metal is discretely painted to match the wood; oftentimes, when people learn that this loom has metal frame components, they have a hard time identifying them. The SX-60 features a wire resistance brake, which is released by pressing the brake pedal. This type of brake holds the warp under greater tension and offers maximum control when advancing the warp. The SX-60H is the taller version of the SX-60. With slightly longer metal tubes, the SX-60H offers 2-3” more leg clearance than the SX-60. Weavers who are 5’8” or taller, or who have long legs, should consider the SX-60H. The WX-60 is SAORI’s all-wood foldable loom. Like the SX-60, the WX-60 can be collapsed for storage and transport. The WX-60 can be completed disassembled, which is handy if you need to ship the loom. The angles on the WX-60 are slightly different than the SX-60. The WX-60 opens wider, which creates about 4cm more working surface than the SX-60. However, the wider angle reduces legroom. As a result, weavers who are medium height or taller, or who have heavier thighs, will have to purchase height extenders. The WX-60 has a gravity resistance kick brake. This brake holds the warp under tension with the use of a rubber gasket and a steel ring. By gently kicking the brake bar, the gasket is disengaged, allowing the warp roller to advance. The kick brake system is best suited for people who do not have strength in their legs. This brake does not offer the same amount of control as the wire brake on the SX-60. This is often the deciding factor when it comes to choosing between the SX-60 and the WX-60. Height extenders offer more legroom for the WX-60. Height extenders are available in two sizes: 5 cm and 10cm. They must be purchased in addition to the loom. The height extenders are compatible with the SAORI WX-90. 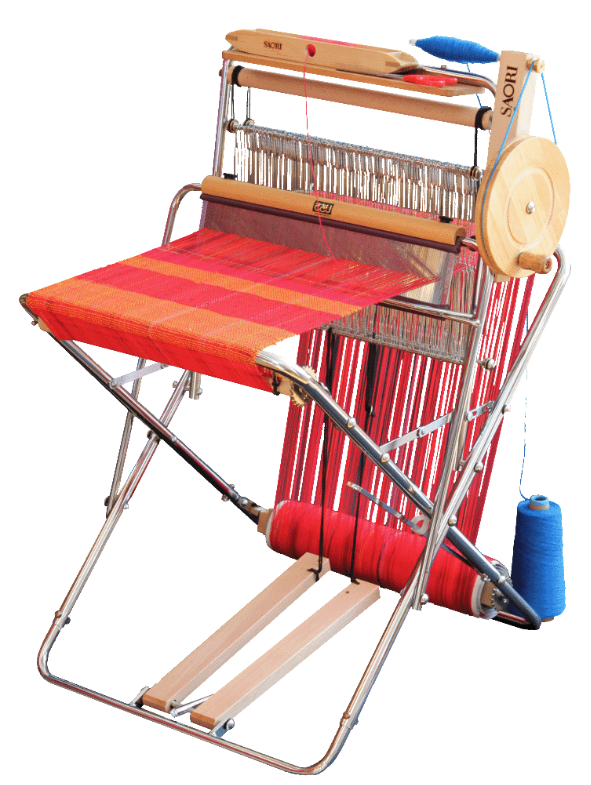 Another unique feature of the WX-60 is the option to purchase wheels, which can be attached to the bottom of the loom. The wheels are compatible with the SAORI WX-90. The CH-60 is SAORI’s non-folding loom. It is made from all wood and can be completely disassembled. This loom uses a hand-operated gravity resistance brake, which is ideal for people who have very limited use of their legs. The warp roller is set up higher on the back of the loom, which eliminates the need to kneel while winding the warp roller. The CH-60 is an absolutely beautiful loom. It ideal for people who have difficulty bending down, or who have a physical limitation. It is often overlooked because it is not foldable. However, the footprint of this loom is just a bit larger than that of the SX-60 and WX-60. If you do not need a foldable loom, you should give the CH-60 serious consideration. The SAORI Piccolo has an all-aluminum frame. The metal tubing has two height adjustments. Lightweight and extremely portable, the Piccolo is good option for children and petite adults. The maximum weaving width of the Piccolo is 40cm. Because of its unique design, the Piccolo is not compatible with most 60-series accessories. Fortunately, SAORI ready-made warps are compatible with the Piccolo. The Piccolo is an excellent option for people who enjoy traveling with their loom, and who do not need to weave beyond the 40cm width. Best of all, the leg clearance on the Piccolo is just 1cm lower than the leg clearance on the SX-60. The WX-90 is SAORI’s newest loom. Built on the design of the WX-60, the WX-90 offers 90cm of weaving width. Like the WX-60, the WX-90 can be completely disassembled. The WX-60 height extenders and wheels are compatible with the WX-90. The WX-90 is a beautiful loom. If you want a wider weaving width and are considering the WX-90, remember that the accessories for this loom are more expensive than the accessories for the 60-series looms. Purchasing a SAORI loom is a big decision. The quality and craftsmanship of all SAORI looms is exceptional, and the differences between the various models make it difficult to make direct comparisons. The following are my observations, based on my own experience, along with the feedback I have received from students and customers. The WX-60 has almost universal appeal. The all-wood construction is an attractive feature, especially for people who plan on keeping their loom in a visible location within their home. However, if you need to purchase the height extenders, the price will increase significantly. Similarly, the wood frame can be difficult to slide on some floors, which may make purchasing the wheels necessary. These options add to the final purchase price. While the rubber gasket brake on the WX-60 is a smart solution for those who have difficulty pressing on a brake pedal, this system is very sensitive. The most common feedback I hear is that the brake releases for too long, which causes the warp roller to unwind too far. This affects the overall tension on the loom and can interrupt the weaving experience. This issue can be solved with proper technique and by developing touch. As I mentioned earlier, the SX-60 is a workhorse. The durability of this loom is remarkable. It can be transported easily and without fear of damaging the frame. The wire resistance brake is another feature that makes this loom a standout. It provides an incredible amount of tension control. Students who learn to weave on the SX-60 have a difficult time adapting to the WX-60 braking system. Another benefit of the SX-60 is that it is easy to slide on the floor. The downside is that the paint may scratch off from wear. That said, all looms are meant to be used, and all looms will show wear with use. The CH-60 is an outstanding loom. The design aesthetic makes it a real show-stopper. I know several instructors who have said if they could only have one loom, the CH-60 would be it. While it is the most expensive in the 60-series, the CH-60 should be considered if the price is in your budget and foldability is not a requirement. The Piccolo is charming, perfect for those who want take their loom on the road and don’t mind the 40cm weaving width. However, if you think you might want to upgrade to a 60-series loom in the future, please know that very few Piccolo accessories are compatible with the 60-series looms. So while the Piccolo offers excellent value, keep in mind that if you might outgrow it, you will be starting over in terms of accessories. In my experience, I have noticed three trends. The first is that people who do research online without having the opportunity to try a SAORI loom are drawn to the WX-60 because of its all wood frame. The second is that, almost without exception, when students who have been weaving in my studio decide to take the leap and purchase their own loom, they buy the loom they enjoy working on the most. And that loom is almost always the SX-60/SX-60H. The third is that SAORI weavers love their SAORI loom, regardless of the model they own. My personal loom is the SX-60H. Based on my style of weaving, I prefer to have a lot of control over my tension, so the wire brake system is a must. That said, I truly enjoy working on the WX-60. It is quiet and very comfortable. I am tall, so when I work on the WX-60, I need the 5cm risers for leg clearance. While I enjoy the additional work area that the WX-60 offers, I still prefer my SX-60H.